As we wrap up our 2015 Calendar year, one of our big to-do lists is to order as many T1D supplies as we can. 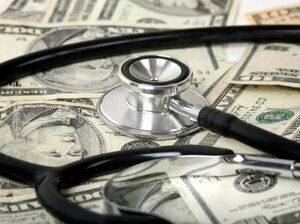 Our deductible has been met and as a result, our out-of-pocket expenses are minimal. Minus Continuous Glucose Monitoring (CGM) supplies, we pay nothing. But yes, we still pay for our CGM - despite the deductible allowance being met. It's one of the chronic disease biggest burdens we shoulder. The cost from CGM is akin to several luxury items or a substantial annual vacation. Having two daughters that both utilize CGM daily, means that we are using a new sensor roughly every 1-2 weeks. Each sensor is $100.00 and a box of four is roughly $400.00. One box for each daughter means that cost multiplies to $800.00 a month. The additional expense for using CGM include an annual receiver charge of $500 per child plus a multi-year transmitter cost of another $1000.00 per child. The reality is to keep both girls on their life-saving, medically necessary, continuous glucose monitors, the usage cost amounts to a whopping $12,600.00. It's a dilemma for many. What would you do with almost $13,000.00? What if the choice was to remain healthy and well, alive? Clearly there is no amount of money that would compete with life-saving technology, especially when it depends on your child's life. The irony of our predicament is that by using this technology, we have avoided costly in-patient hospital visits, expensive out-patient clinic hours and even additional prescription costs from emergency supplies such as Glucagon. 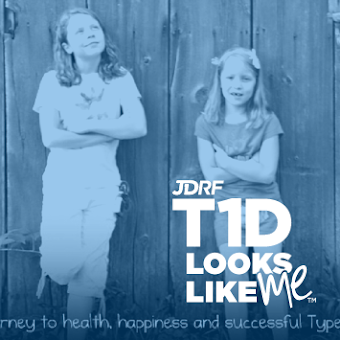 Despite being diagnosed with Type 1 Diabetes, our children are healthy. 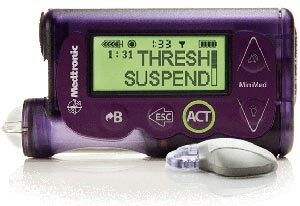 I am convinced that this is in large part to our steadfast CGM use since 2007. If you have a moment, use the link above to share your own CGM story. If you have been able to cover the costs or even if you haven't, everyone should have their voices heard. Truly, we can #makehealth. 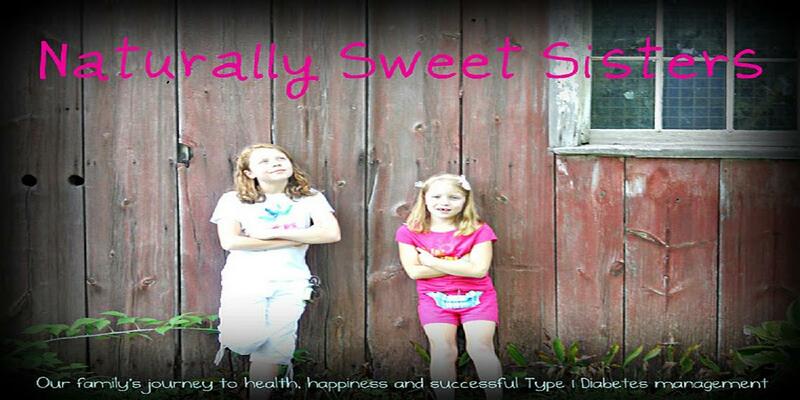 Please continue to VOTE for Naturally Sweet Sisters @peds2040 for the Diabetes Emoticon App. We need your help to secure a spot on the Innovation Beach (mock) Shark Tank. The girls say thank you!!! My cousin recently posted a thoughtful Facebook comment regarding her plan for the upcoming new year. Having a marketing background, she said organizing was part of her nature by creating a yearly vision statement, complete with a theme and tone. She further noted how helpful it has been as a guide to provide direction and consistency to achieving personal, family and even professional goals. Oddly enough, I do it too. Maybe you do as well. Our family vision for 2015 was 'The Year of the Adventure." For the four of us, it provided a consistent reminder of what we wanted to achieve. Mostly, we wanted to break out of our comfort zone (as I have often said, I know we are safe with T1d when we are at home together) and try new things, albeit safely with T1d. Whenever one of us felt unsure of an opportunity, we referred back to our January theme and reminded ourselves that this was truly 'The Year of Adventure'. As a result, I took a leap and tackled projects that required tapping into my professional life, shifting responsibility and even several solo travel adventures. The Naturally Sweet Dad sought and earned a new challenging professional position while managing our home during my absence. Our oldest ventured off to not only a brand-new high school but sought to earn and complete a trip to Washington D.C. through iCAN and TAC, position as Student Council Class Treasurer, Student Government, Key Club and Varsity Girl's Golf - all new experiences. In turn, our youngest daughter started a new junior high school, applied and achieved a spot on the yearbook committee, the local theater troupe and volunteering as a mascot for her sister's golf program. Whew! Truly, it was a year of adventure. Through those experiences, all four of us achieved personal and family growth. The Naturally Sweet Dad renewed his multi-tasking skills as an amazing professional leader and home master organizer. I learned that I still have some ninja-Jedi brain power leftover from being a mom and can keep up with the big kids. And well, those girls - they just beamed through each achievement. One of my favorite quotes was our oldest acknowledging how happy she is. Our family vision for 2016 is "No limitations, No boundaries." As the Naturally Sweet Dad and I discussed, the only limitation is our perceived notion of what our boundaries are. 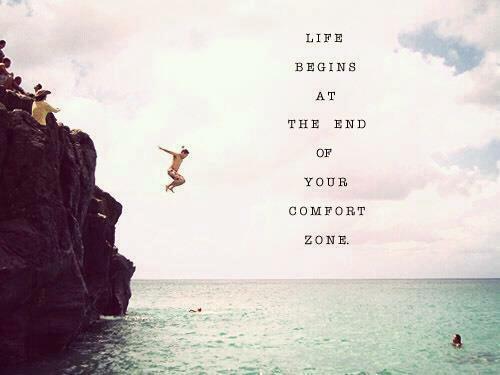 We hope that we can create a paradigm shift within ourselves to show that we can do anything we set our minds too. It's especially important as T1d often feels as though it imposes restrictions on the how, what, where and why. While the girls remain with us through the last leg of childhood, I want to ensure that we not only talk about being able to do anything you want, but also, model the same behavior within ourselves. We can do it! Raising our glass in a toast to ALL OF YOU too! Remember "No limitations, No Boundaries!" 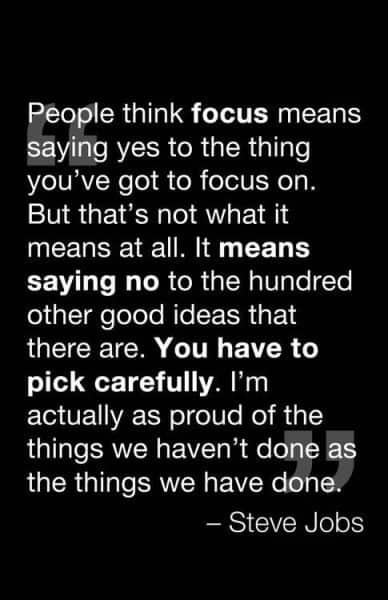 What is your vision for 2016? We would love to hear from your inspiring perspective. Please drop a line, leave a comment, Tweet @natsweetsisters or chat on Facebook. Over the last two years, the girls have been involved in a collaboration with Dr. Joyce Lee, Pediatric Endocrinology at the University of Michigan, Mott Children's Hospital. 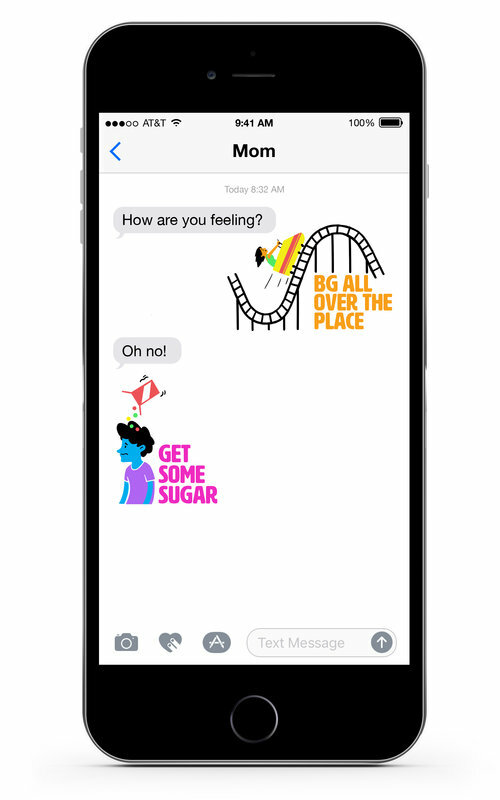 You can read more about the project known as the Diabetes Emoticon App HERE and HERE. As a result, the girls will be heading to represent young patients at Peds2040.org. You can read more about that HERE. Now for the really exciting part... the girls have an opportunity to appear on a mock Shark Tank through the conference that is entitled Innovation Beach. If you didn't have a chance to see their video, you can check it out HERE. For the first time, the youngest patients have the ability to have their voices here. Thanks in part to wonderful, creative and talented adults like Dr. Lee that recognize that great ideas can come from anyone - no matter how old. That concept is truly inspiring. Let's help get the message out! Please VOTE! 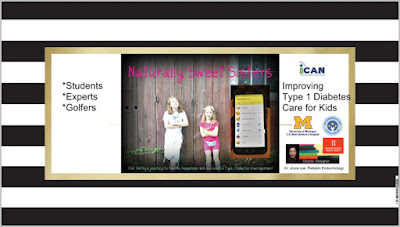 From Naturally Sweet Sister's Facebook Page: "Please help Reece and Olivia, and our wonderful Dr. Joyce Lee, Pediatric Diabetes, University of Michigan, Mott Children's Hospital by voting for the Diabetes Emoticon App for Innovation Beach at peds2040.com. If securing a popular vote, the Naturally Sweet Sisters will have a chance to pitch (like a mock Shark Tank) the Diabetes Emoticon App concept in front of providers, investors, health plans, and representatives from the most innovative pediatric hospitals worldwide. The goal is to share the positive outcome of health care innovation from the collaboration of the youngest patients and doctors. This is an amazing opportunity and the girls would love your help to make it happen. You can vote daily from now until January 7th, 2016." 'Naturally Sweet Sisters', then press VOTE. That's it! And please vote once each day intil January 7th, 2016. I will be updating both Twitter @natsweetsisters and online with updates as to the progress. If the girls win, they will be notified on January 8th, 2016. You can also reach out to Dr. Lee on Twitter @joyclee to learn more about her #makehealth and her wonderful approach to creating improvements within healthcare. Please SHARE with EVERYONE and many, many thank-you's from our Naturally Sweet Sisters. Our Naturally Sweet Sisters are preparing for the upcoming Pediatrics 2040 Conference in Laguna Hills, California from January 6th - January 9th, 2016. If you haven't heard about the amazing brainpower of #doctors, #makers, #experts that are creating change within the medical community, please hop over to http://www.peds2040.org/ and check out the speaker line-up. The agenda is below and you will not be disappointed by the wonderful assortment of topics - especially the Young Innovators Workshop - a program designed for kids to share ideas of improvement within the medical community. This is a hands-on event in which kids will team up with researchers from around the US - including Stanford and Orange County Children's Hospital (OCCH) to discuss ideas, create a mock up and follow through with implementation. From Idea to Reality for Innovators – This workshop will provide background concepts in innovation in health care and also review case studies in innovation in pediatric health care. Essential Concepts in the Current Era – This workshop will review basic concepts of genomic medicine from DNA sequencing to clinical interpretation and personalized medicine. From Big Data to Deep Learning in Health Care – This workshop will introduce all relevant topics in the use of artificial intelligence in medicine, including data mining/ predictive analytics, cognitive computing, and deep learning. Uses of 3D Printing Techniques in Pediatrics – This workshop will look at the innovative new ways that 3D printing can be applied for diagnosis and therapy in children. There is still time to register too. Our Naturally Sweet Sisters will be representing Dr, Joyce Lee, Michigan Hackers, University of Michigan Endocrinology, #Makehealth, Teen Advisory Council (TAC), Mott Children's Hospital, iCAN, JDRF and the community of #teent1d. Stop by our booth and say hello. We would love to meet as many of our online friends and families as we can. We hope to share ideas and inspire others that anything is possible through collaborative health care.